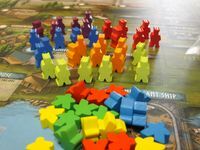 Subject: What custom meeples do you want for your games? The Game Crafter is looking to add a bunch of new meeples in 2018 for pimping out your favorite board games. 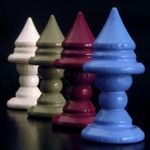 What custom meeple shapes would you want if you could have anything at all? I don't want meeples at all, actually. Fair enough. Is there anything you do want to enhance your games? Maybe a friend, but I don't expect you to work miracles. Well, I kinda want some “cheaples” - disposible and inexpensive ones that I can set up for air gun night at the local shooting range. In different colors in and shapes. They are just the right size for making tough, little, fun targets. If there was any way to make burgle bros style meeples that would be cool. If you had 6 or so standard blanks and a custom sticker sheet template it would be fun to have them in some games. I'm getting a bit tired of those flat-sided meeple figures, whether decorated or not. So how about luxury wooden pawns? By pawns, I'm referring to elegantly shaped abstract pieces, derived from a cylinder, e.g. chess pawn or parcheesi piece. A range of different shapes, sizes, colours (including natural stains), would be nice. There seems to be a lot of Viking themed games out recently. I agree with this but, if I'm playing someone else's game & they have pimped out Meeples then that's cool. I'd love to see more versions of wooden coins. maybe a little larger like the size of poker chips. +1. If they could be stackable that would be even nicer. A way so same size coins cannot slide off a stack and smaller ones fit on top. And in the same category, could use some victory point tokens too. Perhaps some artistic person could come up with a design that works for both purposes. It would be something I would have next to the games and pull out if a given game could use it. Some 1's, some 3's, some 5's, some 10's, and some 20's. A total of 1k gold to have enough for 4-5 players and various games (but might have to research a few games to get the right amount). Bonus: 4-5 small chests for storing coin/points in games where it is hidden information. I am thinking ~€25 with EU shipping for a set. Less I would rather have extra coins (or the bonus chests) and more it starts getting a little pricey. Simple bulk cheap meepley resources - like wood, food, etc. Rather than having to buy specific sets for specific games, or only being able to find fancy painted ones, just some nice simple, basic ones for swapping into games. I have been dying for some non-cute, non-screenprinted, more affordable animeeples for Dominant Species. I have some .ai shapes I prepared for someone else who never produced them if you are interested. A replacement set of knights & king for the CMON version of Torres that don't fall over at the slightest bump. A toolkit of pieces to support color blind gamers. For examples, some green and blue meeples with bold black stripes, blue and green disks with bulls-eyes, blue and green cubes with high contract circles painted on them, etc. I'd keep a "toolkit" of these in my cons' library so gamers could borrow pieces that help them enjoy poorly designed (for them) games. I don't really know what pieces should be in this kit, but a wiki for gamers who face these challenges would probably work. Put photos in it showing differentiated pieces next to each other, so CB gamers can yea/nay them and make suggestions. This could extend your business beyond game piece "pimpage." I'm happy to help with the data collection necessary for the design, but only after a commitment to make the selected parts.